Carteck is the brand name for Teckentrup, a leading German manufacturer of garage doors that have been on the market for 80 years, meaning they produce robust, higher level security doors for your home. 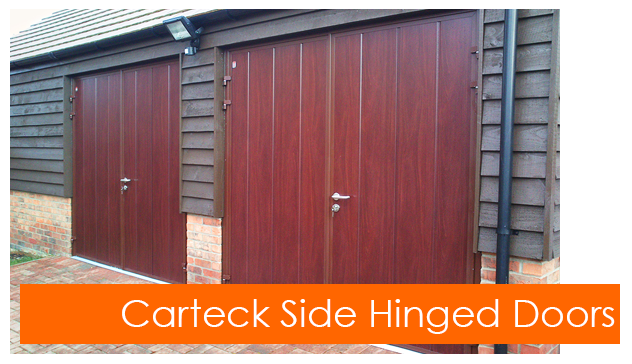 Carteck offer fantastic design options, allowing you to choose the panelling style and colour, as well as the appropriate features to keep your garage stylish, safe and secure. 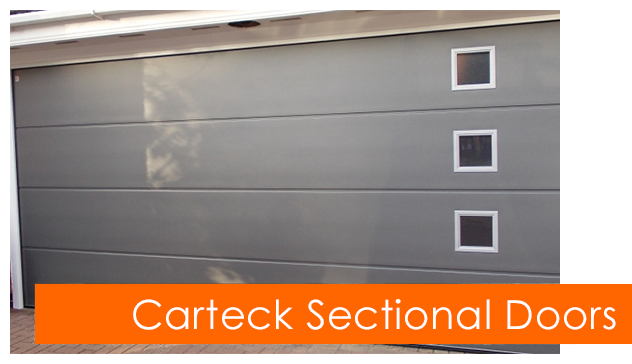 All Carteck doors are made with 40mm of insulation and steel panels, ensuring warmth and comfort are sustained within your garage. Insulate from the heat, the cold and sound. Carteck are now aslo offering a brand new paint finish – a higher quality painted wood effect finish with improved scratch resistance and UV stability. A Carteck sectional door will create a stylish and modern addition to your home, consisting of features of your choosing. A variety of colours and woodgrain effects are available, as well as the option to have windows included, giving you the ability to create a truly unique and personal look to flatter your home’s aesthetic. Sectional doors are becoming increasingly popular because of their panels giving the illusion of a traditional door, yet they are equipped with contemporary efficiency, safety and security standards. The vertically-lifting door prevents the door protruding outwards, allowing for more space on your driveway and inside your garage. 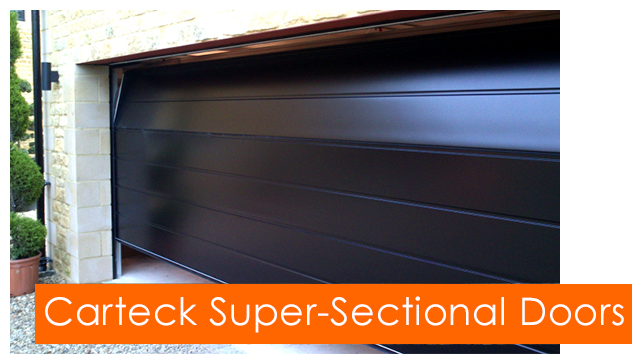 Carteck’s Super Sectional range of doors accommodate for garages requiring doors of up to 26 feet wide. Although designed to optimise the use of larger garages, no compromises are made in terms of the design, security or safety of the product. The size of these doors inevitability equate to a heavier garage door, however Carteck ensure of all necessary safety features. The operation of the door also remains to be smooth and easy as it is controlled by a remote control motor. Please note – although a wide range of colours are available to select, there are fewer than the standard range. Carteck provide the traditional side hinged door with a modern twist as they allow you to achieve a look that coincides with your home in the style and colour you desire. These convenient doors that provide easy vehicle and pedestrian access are constructed of 40mm thick aluminium panels with versatile personalisation options such as colours, finishes and windows. The strong locking system assures you of good security, while the material and construction provide strength through time and weather. Carteck is the brand new of a major German manufacturer called Teckentrup. It's a British and German mix, with Sectional doors made in Germany and side-hinged doors made in the UK. German manufacturers are known for their exceptional high quality, and their influence on the British made products is obvious. 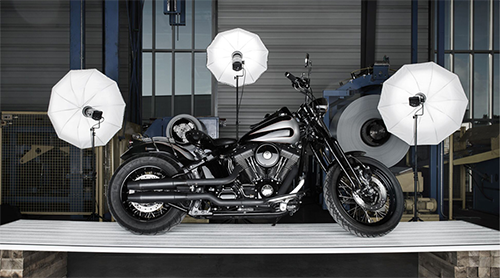 Exceptional build quality meets ingenius design, and their products look fantastic too. Carteck is one of the giants of the UK market for a reason, and that's because of one thing: Quality. Carteck doors have a number of excellent electric motor drivre systems, all designed to make your life easier. Automating a garage door can have a massive impact on its ease of use and practicality, and with a number of options, Carteck are perhaps the best suited to automation. One of the options is the CarTeck Drive 500 and 600. Both the 500 and 600 can lift any door size, the only difference is a rang of options and extras the 600 is avilable with. The 600 is a little faster, and also has twice as many lights. Marantec are a third party company whose Comfort range of elevctric operators are ideal for Carteck products. They can operate multiple types of doors, whether they are big, small, old or new. The Comfort range of operators are also energy efficient, they use energy saving bulbs and LED lights, and there are a number of options within the range to suit each requirement. Both of these operators are smooth and quiet, operating with a minimum of fuss and really do dramatically improve the usability of your door. Carteck doors are not just visual pleasing, they also have many little technical advantages over other doors, which add up to make a real difference. The GSW 40 Sectional door for instance offers excellent security via two point locking and optional bolts on manually operated doors. Wear resistant hinges are also useful for scurity, and the panel sections are designed to be ultra strong due to the double skinned high strength galvanisded steel used, fit tight with no big gaps for an thief to prise open. 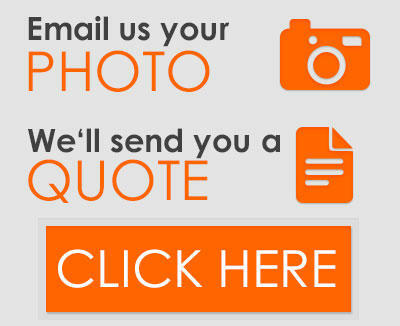 Give The Garage Door Centre a call where we are able to guide you in regards to your requirements, as well as discuss and answer any questions you may have.